DEVESELU, Romania --- U.S. European Command’s naval component, U.S. Naval Forces Europe-Africa/U.S. 6th (CNE-CNA/C6F), recognized a key milestone to complete Phase II of the European Phased Adaptive Approach (EPAA) by deeming the Aegis Ashore Missile Defense System (AAMDS) in Romania as operationally certified in a ceremony held in Deveselu, May 12, 2016. This Ballistic Missile Defense (BMD) System represents a significant increase in the capability to defend NATO European territory from attacks originating outside the Euro-Atlantic area, and is a key milestone in the development of NATO Ballistic Missile Defense. “Today, this site joins the four U.S. Guided Missile Destroyers in Rota, Spain in reaching Phase II of the European Phased Adaptive Approach. As we cut the ribbon, the watchteams are trained and ready, the system has been tested, and we are now in the progress of integrating this site into the NATO integrated Air and Missile Defense Architecture,” said Adm. Mark Ferguson, commander, U.S. Naval Forces Europe-Africa. -- On Sept. 17, 2009, President Obama announced the concept of EPAA, which calls for using Aegis-based BMD capabilities, both afloat and ashore, to defend Europe against ballistic missile threats originating from outside the Euro-Atlantic Area. -- The site first broke ground in Oct. 28, 2013. At a ceremony hosted by the Romanian Ministry of Foreign Affairs Dec. 18, 2015, U.S. and Romanian government officials announced that the major military components of the Aegis Ashore Missile Defense System in Romania were complete and had been transferred to the Commander, U.S. 6th Fleet. -- Since that time the AAMDS-Romania site and U.S. Navy crew achieved operational certification through a series of unit-level and theater-level tests and exercises conducted over the past five months, which validated the system’s capability to integrate into the U.S. and NATO ballistic missile defense (BMD) architecture. -- Construction of a second Aegis Ashore site in Poland is part of the final phase of EPAA. The ground breaking is scheduled for May 13, 2016. A United States missile defence system aimed at protecting European NATO Allies from ballistic missiles threats was declared operational at a ceremony in Deveselu, Romania on Thursday (12 May 2016). “Today represents an important moment for NATO and transatlantic security,” NATO Secretary General Jens Stoltenberg said, speaking alongside Romanian Prime Minister Dacian Ciolos and U.S. Deputy Secretary of Defence Robert Work. Mr. Stoltenberg underlined that the activation of the site “represents a significant increase in the capability to defend European Allies against the proliferation of ballistic missiles from outside the Euro-Atlantic area”. The first-of-its-kind land-based missile defence installation is designed to detect, track, engage, and destroy ballistic missiles in flight outside the atmosphere. Dubbed “Aegis Ashore”, the base uses technology which is almost identical to that used on U.S. Navy Aegis ships. “The threat to NATO Allies from missiles outside the Euro-Atlantic area is real,” the Secretary General said. “Several countries are seeking to develop or acquire them. Our missile defence programme represents a long-term investment against this long-term threat.” He added that NATO ballistic defence was purely defensive and not directed against Russia. The site in Deveselu is part of a larger effort to protect European Allies against ballistic missiles. Other components include a radar facility in Turkey, four U.S. guided-missile destroyers in Spain and a headquarters in Ramstein, Germany. Denmark and the Netherlands are upgrading their frigates with radar capabilities. The United States will also start construction of a second land-based interceptor site in Poland on Friday (13 May) that is due to come online by 2018. Earlier on Thursday, Secretary General Stoltenberg met with Romanian President Klaus Iohannis for talks on the the security situation in the region and preparations for the NATO Warsaw Summit inJuly. Mr Stoltenberg also visited NATO’s Multinational Headquarters South-East in Bucharest together with Romanian Defence Minister Mihnea Motoc and Foreign Minister Lazar Comansecu. The Aegis Ashore Missile Defense System is part of the European Phased Adapted Approach, designed to protect European NATO allies, and U.S. deployed forces in the region, against current and emerging ballistic threats from the Middle East. Q1. What is Aegis Ashore Missile Defense Site-Romania or Aegis Ashore? A1. The Aegis Ashore Missile Defense System (AAMDS) has many of the same components used at sea on guided-missile destroyers and cruisers, but has been adapted to perform the ballistic missile defense mission from land. In this case, Aegis ashore is in Deveselu, Romania. It’s part of the European Phased Adapted Approach (EPAA). EPAA is designed to protect European NATO allies, and U.S. deployed forces in the region, against current and emerging ballistic threats from the Middle East. -- In general, the ballistic missile threat to the region is growing both quantitatively and qualitatively. The EPAA’s purpose is to help deter future conflicts, primarily those from Iran and other nefarious non-state actors – and to defend ourselves and our NATO allies should deterrence fail. Q2. What does the U.S. Navy mean when it says AAMDS-Romania is “certified” and why is it a big deal? A2. AAMDS-Romania will have successfully completed operational validation as part of the EPAA Phase II architecture. This was accomplished through participation in the Cross area of responsibility Air and Missile Defense Exercise (CAMDEX) 2016. It is significant as CAMDEX 2016 is a unifying concept for exercise events designed to assist NATO in preparing for their initial operational capability (IOC) of AAMDS-Romania. Q3. So what’s the purpose of missile defense? A3. Ballistic Missile Defense (BMD) is the capability to intercept and destroy ballistic missiles in flight, destroying the warhead and any potential weapons of mass destruction it may be carrying. -- We remain very concerned about Iran’s ballistic missile program. As long as Iran continues to develop and deploy ballistic missiles, the United States will work with our allies and partners to defend against this threat, this is the primary purpose of EPAA and Aegis Ashore. -- President Obama has publicly stated our commitment to protecting the U.S., U.S. deployed forces, and our European allies against the growing threat of ballistic missiles. In September 2009, on the recommendation of the Secretary of Defense and Chairman of the Joint Chiefs of Staff, the President announced the EPAA for missile defense to provide that protection. The EPAA is intended to be the U.S. voluntary national contribution to NATO BMD for protecting NATO European populations, territories and forces, including Romania, and will augment the defense of the United States. -- The Aegis Ashore site in Romania is an important step in our efforts to protect against the growing threat posed by the proliferation of ballistic missiles of increasingly greater ranges, lethality, and sophistication. The Aegis Ashore site in Romania provides a defensive capability to protect NATO European territories, populations and forces against ballistic missiles. A4. The land-based ballistic missile defense capability will use a defensive system almost identical to that used on U.S. Navy Aegis-capable guided-missile destroyers and cruisers. The system is designed to detect, track, engage, and destroy ballistic missiles in flight. -- If launched, the interceptor flies out above the atmosphere and destroys the enemy ballistic missile warhead in flight. SM-3 missiles are defensive weapons. They carry no explosive warheads of any type, and rely on their kinetic energy to collide with and destroy incoming enemy ballistic missile warheads. The system in Romania will be connected to other EPAA missile defense assets to maximize their effectiveness. Missile defense and the EPAA assets are strictly defensive in nature. The U.S. interceptors are not armed with an explosive warhead of any kind. Instead, the interceptor collides with the threat warhead and relies on energy derived from the collision of two objects moving at incredible speeds to neutralize the threat. The interceptors have no capability as an offensive weapon. Q5. 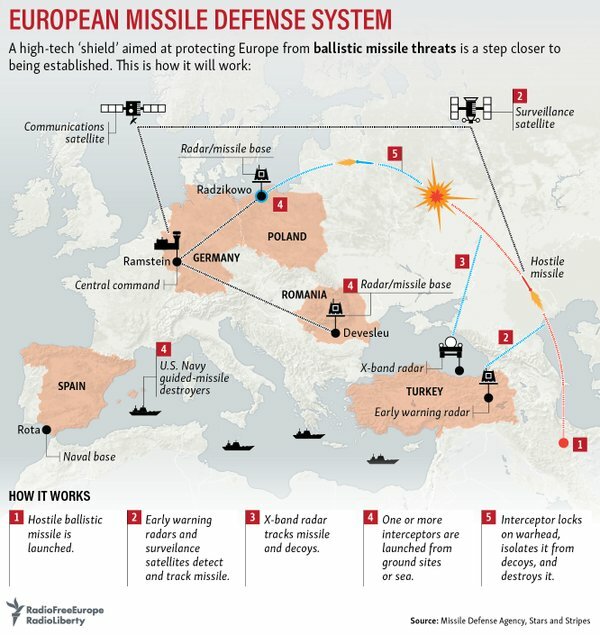 What country poses a ballistic missile threat to Europe? A5. The proliferation of missile technology and non-state actors willing to use violence to achieve their goals means that a missile attack could originate from many places. However, we remain very concerned about Iran’s ballistic missile program. As long as Iran continues to develop and deploy ballistic missiles, the United States will work with our allies and partners to defend against this threat. -- We will also continue to take other actions to counter Iran’s ballistic missile program, including through regional security initiatives with our partners in the region, sanctions, export controls, and the 34-country Missile Technology Control Regime (MTCR). BMD is one response the U.S. is taking to address the threat from the Middle East region posed by ballistic missiles of increasing range, lethality and sophistication, as well as nuclear proliferation concerns. The threat to U.S. forces and European allies and partners is growing. Improved NATO BMD capability and capacity is a deterrent to such threats. Q6. Is Aegis Ashore – Romania (or EPAA in general) a threat to Russia? A6. No. This system is defensive in nature and not a threat to Russia. Russian cooperation is important for regional stability and global security. We have also consistently reassured Russia that our missile defenses in Europe are not capable of intercepting Russian ICBMs. Our limited missile defense capabilities in Europe are not designed to engage the large and sophisticated Russian strategic nuclear forces. DEVESLU, Romania --- The first Aegis Ashore site in Europe, based on proven Lockheed Martin (LMT) technology, is now actively monitoring the skies of southern Europe for ballistic missile threats. The U.S. Navy [has] operationally certified the Aegis Ashore site at Deveslu Air Force Base in Romania. This officially fulfills Phase II of the European Phased Adaptive Approach, a plan to protect deployed U.S. forces and our European allies from ballistic missile attack. This milestone was marked during a ceremony on May 12 in Romania. The certification, comes at the same time as construction commences at the second European Aegis Ashore site, in Poland. A groundbreaking ceremony will be held in Poland on May 13. "It's fitting that work on the Poland site begins just as Aegis Ashore's important mission in Romania officially commences," said Brendan Scanlon, director, Lockheed Martin Aegis Ashore programs. "The lessons learned and incredible teamwork that brought the Aegis Combat System ashore will lead to even greater cost-savings and efficiencies for the Missile Defense Agency, the U.S. Navy and the sailors who protect the country and its allies." 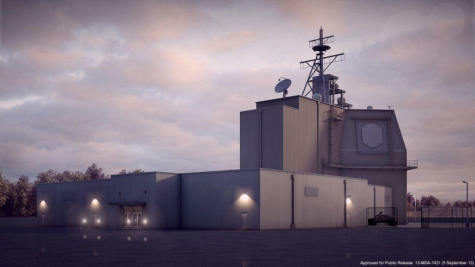 Lockheed Martin received the contract for Aegis Ashore in Romania in 2010, which heavily leveraged the proven shipboard Aegis Ballistic Missile Defense (BMD) system. The aggressive delivery timeline was achieved in 2015 thanks to the minimal development required to establish the on-shore system, innovations in modularity, and teamwork. The Corporation leveraged lessons learned from its more than 40 years of Aegis experience to fulfill the United States' desire to conduct new missions with existing capabilities. The central component of the Lockheed Martin-developed Aegis BMD Combat System is the SPY-1 radar; the most widely-fielded naval phased array radar in the world. The Aegis system and SPY-1 radar provide the U.S. and allied nations with advanced surveillance, anti-air warfare and missile defense capabilities. Elements of the Poland Aegis Ashore Weapon System, including SPY arrays are currently under production by Lockheed Martin. The U.S. Missile Defense Agency is expected this spring to award a contract for the installation and test of the Aegis Ashore system.